Trampolines are one of the greatest ways of bouncing your energy out, and they provide interesting ways to make the physical activity fun and interesting. It is obvious that you will want to start bouncing on your trampoline as soon as you bring it home. Whether you have purchased your trampoline or still deciding on which model or brand you should purchase, you cannot deny that assembling the trampoline is one of the most important chunks that you have to take care of. Also, assembling your trampoline can be extremely difficult if your children are jumping up and down all around you waiting for the new toy. You will want your kids to start trampolining as soon as it comes home, but it is necessary that you take enough time to complete the setup. The extra effort and time that you take to assemble your trampoline will pay a huge dividend in the future. Additionally, you will set up a trampoline that is safer and lasts longer than you expect it to. How Long Does It Take to Assemble Your Trampoline? The assembling of a trampoline is dependent on the model that you have purchased. Some trampolines can be assembled within an hour while the heavier models can take – as much as – up to three hours. However, if somebody helps you to set up the trampoline, the time taken is comparatively lesser than expected. A huge amount of time is taken to attach the springs. Therefore, try to invest in a spring tool, as it will make things simpler for you. A spring tool will ensure that you assemble the trampoline within an hour and will make your task less fiddly. In order to set up a trampoline, the most important things that you will need are the tools. Firstly, you need to check your package and confirm that you have received the correct package. Since trampolines are heavy, they come in two or three packages. If even one piece is missing, it can be troublesome. Next, you have to start getting comfortable with all the trampoline pieces and understand the best part of your backyard, where you can place the trampoline. Spread out all the pieces and cross check them with the manual that you received to ensure that all the pieces are there. It has been observed that the frame might have sections that are identical, but they are not meant for a particular area. You need to assemble your trampoline’s frame first. This part is perhaps the most crucial part as you have to ensure that the pieces are in the proper place. If you own a power drill, it will be easier for you to set the frame up as screwing the bolts with your hands can be a tedious task. Next, you have to attach the trampoline mat or the jumping pad. In order to do this, you will require the spring pulling device as well as the rubber mallet. Double check the instructions to see if your springs are aligned correctly. As you keep on attaching the springs, you will observe that your jumping pad starts tightening. You will require the spring hooks for pulling back the springs to the respective slots. When you see the spring hook hovering over a slot, make use of the rubber mallets to jolt it back into its place. After you have attached the jumping pad, you can put on the spring cover. If you have purchased a trampoline that comes without the enclosure nets, this is definitely going to be a crucial part of the trampoline set-up. You should do this part slowly and steadily as your safety depends on the enclosure net. In case you set up the net in an incorrect manner, it will not be able to provide the intended safety benefits to your kids or you. Herein, attach the enclosure pads with the poles. This is also necessary to prevent a jumper from hitting the poles and getting injured seriously. You can always hire handymen if you feel that you cannot do it alone. There are many guys out there who will love to help you in putting the frame together if you offer the right price to them. Trampolines are exciting pieces of equipment, which allows an adult to transform into a kid in no time. And, a missing part of this fun equipment can lead to injuries. It is your duty to ensure that your trampoline has been set up properly, so as to ensure the safety of the individuals who will enjoy on your trampoline. How to Build a Tricycle for Adults? How to Calibrate a Hoverboard? How To Make a Homemade Laser Tag Gun? How to Make Your Own Hoverboard? 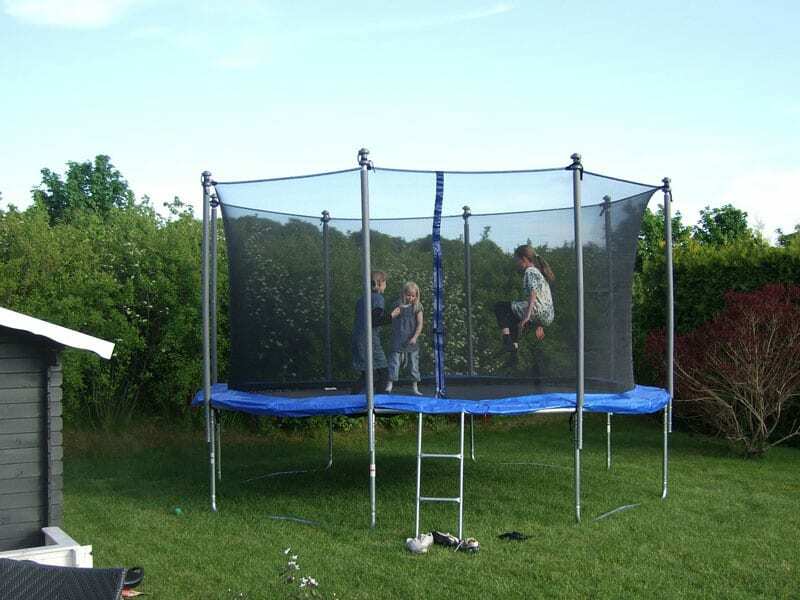 Giantex Trampoline Reviews: Should You Buy? History of Trampolines: Who and When Invented It? Hole in Your Trampoline? How to Fix it?